GeorgeReadLibrary is a Legacy Library. Legacy libraries are the personal libraries of famous readers, entered by LibraryThing members from the Legacy Libraries group. » George Read's legacy profile. GeorgeReadLibrary is also an author. About meGeorge Read (18 September 1733 - 21 September 1798), Delaware statesman and Signer of the Declaration of Independence. Read's family moved from Cecil County, Maryland to New Castle, Delaware when George was young; he studied law (along with Thomas McKean) at Francis Allison's Academy in New London, PA, and later with John Moland in Philadelphia before beginning a practice at New Castle. In 1763 Read was appointed Crown Attorney General for Delaware, a post he held until 1774. He served in the provincial assembly from 1765-1777, and sat in the Continental Congress from 1774-1777, in which capacity he signed the Declaration of Independence (though he had opposed the motion for independence, which got Delaware's support due to the votes of Caesar Rodney and Thomas McKean). Read presided over Delaware's constitutional convention in 1776, and served as speaker of the legislative council and vice president of the state under that constitution. Read served briefly as Delaware's president, from late October 1777 through March of the following year. He sat in the Delaware House of Representatives 1779-1780, and then as judge in the court of appeals for admiralty cases in 1782, also resuming his seat on the legislative council. A delegate to the Annapolis convention in 1786, Read was also selected to represent Delaware at the Constitutional Convention. A strong Federalist, he led the ratification efforts in his state, which was the first to approve the new government. Under the Constitution Read was elected a U.S. 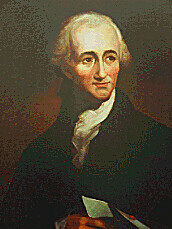 Senator, and served from 4 March 1789 until his resignation on 18 September 1793. He died three days later. In 1763 Read married Gertrude Ross Till, the widowed sister of George Ross, another Signer. They had four children. About my libraryRead was known to have an extensive law library, and was also thought to be widely read in other subjects as well. Much of his library remains unidentified, so any information would be welcomed. This small portion of George Read's law library consists of those books noted in Catalogue of the Choice and Extensive Law and Miscellaneous Library of the late Hon. William Green, LL.D., … to be sold by Auction, January 18th, 1881, at Richmond, VA. … . Richmond: John E. Laughton, Jr., 1881. Other books from that library may have been Read's as well, but are not so noted in the catalog. A probate file for Read has not been located.